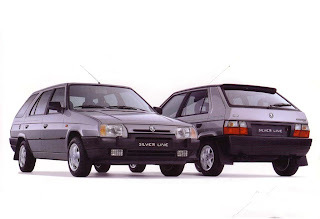 The Škoda Favorit (Type 781) was a range of supermini cars produced by Czech auto manufacturer Škoda Auto from 1987 to 1995. It was Škoda's first car to follow the European trend of locating the engine at the front, mounted transversely, and was also their first car to use front-wheel drive. 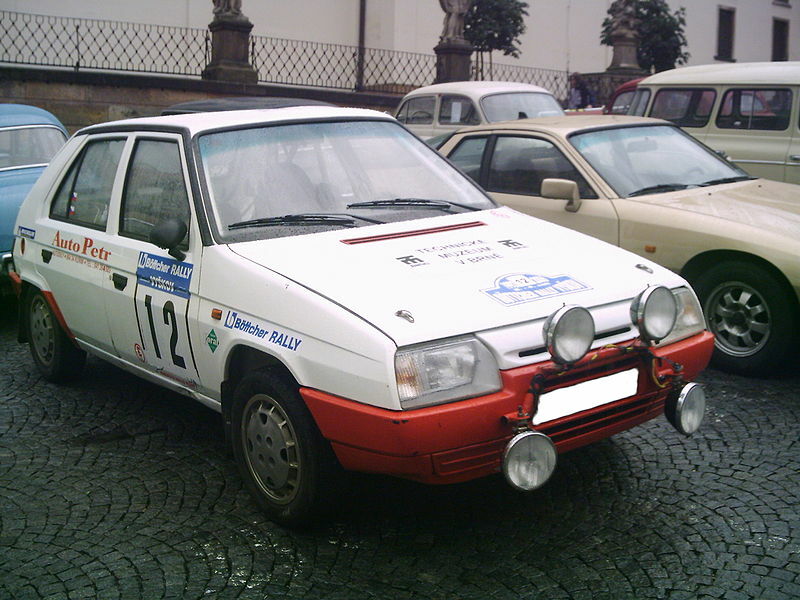 The Favorit was premiered in July 1987 at the Brno Engineering Fair. Like other models in the Škoda lineup, the name "Favorit" had been first used on an earlier vehicle - a large imposing luxury limosine produced between 1936 to 1941. This latest Favorit eventually succeeded the ageing rear-engined, rear-wheel drive Škoda 105/120 Estelle, and was a considerable move towards the modern mainstream in design terms thanks to its Bertone-designed hatchback body and front-wheel drive. 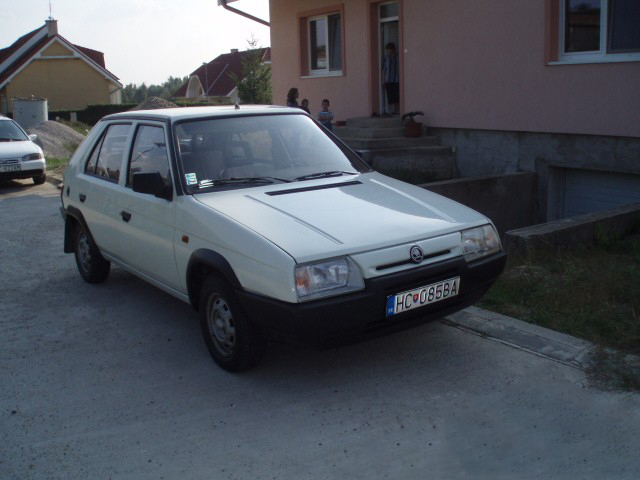 However, the Favorit initially took a long time to get to market - Škoda's then owner, the communist government of Czechoslovakia approved the development of this new front-wheel drive car back in 1982, with actual development not starting until 1983. Disputes between the government’s brief, andNuccio Bertone, the designer, meant that the car was not designed until mid-1985, and full production wouldn't commence until 1987. Probably the worst aspects of this dispute is that a four-door saloon was fully designed, but was never allowed to go into production. 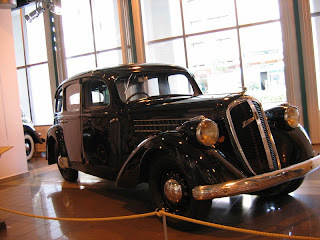 The Favorit proved itself as one of Central Europe's most popular cars, and was also exported to a number of countries including Argentina,Chile, Colombia, Ecuador, Perú, Israel, Poland, Russia, Turkey and other countries. 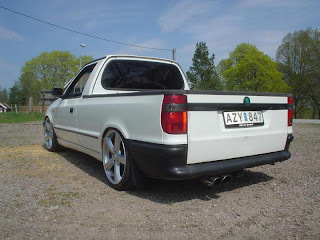 The Favorit was replaced in 1994 by the Škoda Felicia, which was developed in conjunction with Volkswagen Group, who were by then the owners of Škoda Auto. It is perhaps comparable to the Volkswagen Polo (fuel injected versions share the Bosch Mono-Motronic 1.2.3 engine management system with the Volkswagen Polo Mk2 and Volkswagen Golf Mk3) due to its large engine compartment, contributing to the possibility of easy repair. 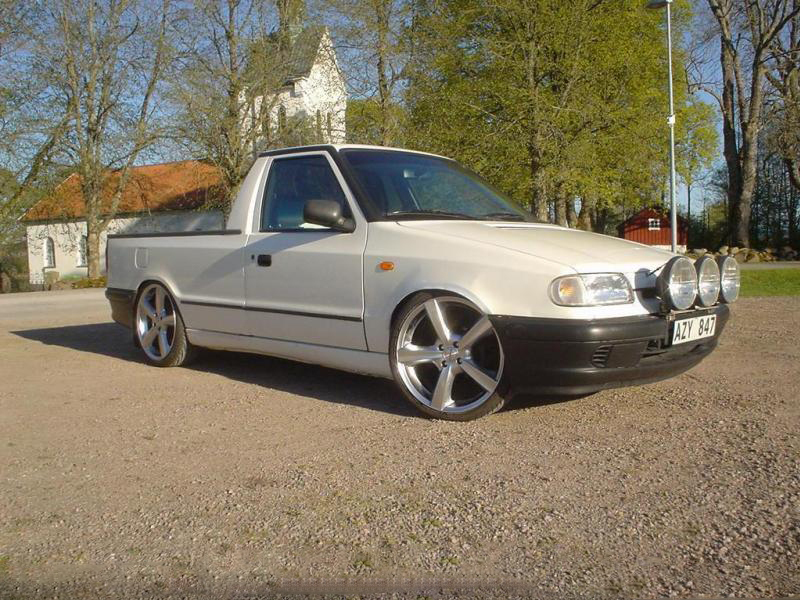 Parts are very universal with other Eastern European cars. Its general design and mechanical functionality is very practical, especially in comparison to a Western car which requires expensive parts, or maintenance for simple knobs, buttons or other simple mechanical and rudimentary apparatus. 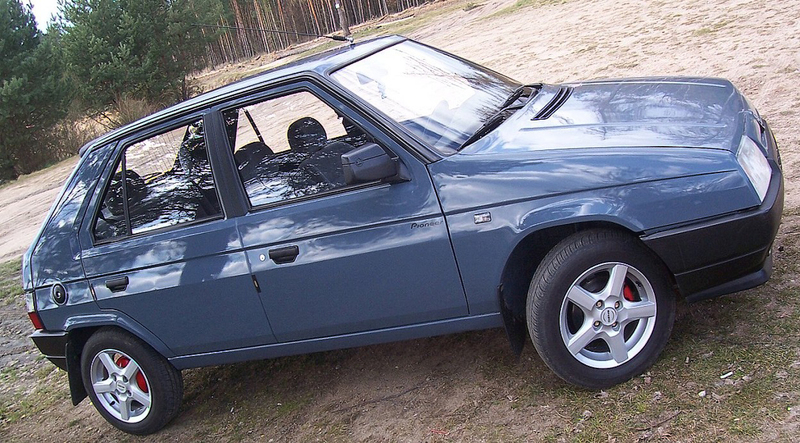 The car body style of the Škoda Favorit was a five-door five-seater hatchback. Constructed from mild steel, it utilised the automotive industries' now well-established monocoque design. A five-door estate version named the Škoda Forman (Type 785) appeared in 1990. This was known as the Favorit Estate in the UK from its launch in June 1991, two years after British buyers were first able to buy the hatchback. The name originates from the English word "wagoner", which in Czech is "forman", or someone who transports goods by wagon. It is a common misconception that the name is somehow related to famous Czech filmmakerMiloš Forman. 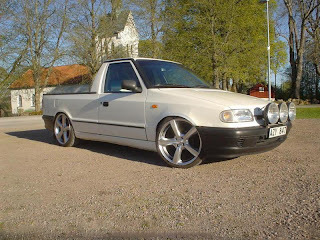 A two-door two-seat pick-up truck, called the Škoda Pick-up (Type 787), was introduced the following year. Following the takeover of Škoda Auto in 1991 by the Volkswagen Group, new developments and upgrades were rapidly implemented on the Favorit. This included new fuel injected catalytic converter versions, marketed as the Li, GLi and the GLXi models were introduced. At the same time many cosmetic improvements were made to the Favorit, such as improved door hinges, Volkswagen seats and interiors, dashboards and instrumentation. Quality control improvements were also implemented, along with safety features such as strengthened beams in the doors, and a redesigned front. 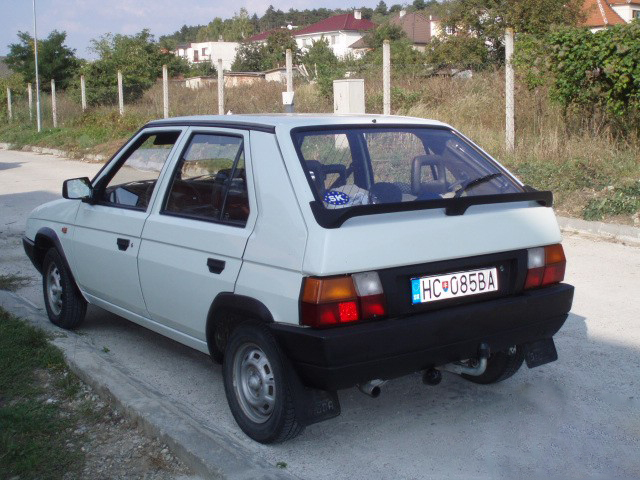 During 1993, another range of modernizations took place, which included mechanical and electrical upgrades to the engine, a facelift of the bodywork, and bigger bumpers. Luggage capacity in the hatchback was 251 litres with the rear seats in the upright position, and this increased to 1,038 litres with the rear seats folded. For more luggage, the back seat could be removed completely. Special versions were made in limited numbers. "Black Line" was sold with a pop-up sunroof, Hella clear rear lighs, tinted windows all-around, power door locks, tachometer, digital clock in the center overhead console, smart intermittent wipers, leather-wrapped steering wheel and shifter knob, Hella headlight washer, and a Blaupunkt stereo with 4 speakers. The car is recognizable from the all-black paint, and the factory 13" Ronal F-Series alloy wheels. "Silver Line" was similar, only in metallic silver color with a black fascia around the back window and the B pillars. 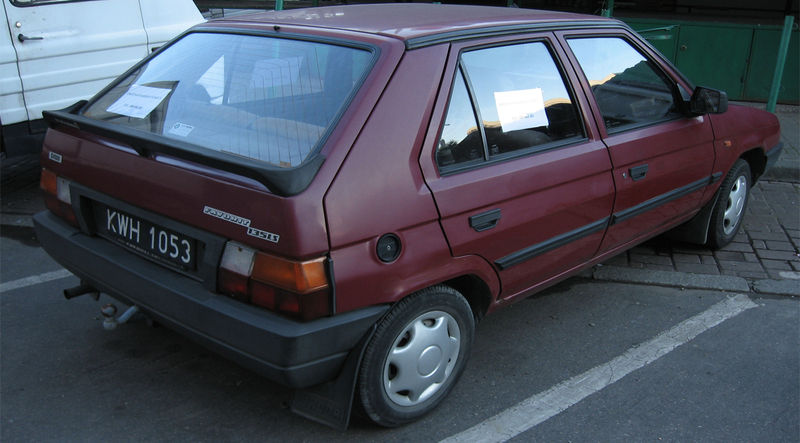 These packages were available with both hatchback and estate body styles. "Solitaire" was very rare, including all of the above plus spoiler on the rear door, factory alarm system, power front windows and fuel injection. The other special versions came with either carburetted or fuel-injected engines. 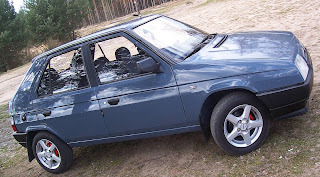 For all body styles, the powertrain of the Favorit used one internal combustion petrol engine, 1,289 cc (78.7 cu in), inline-four-cylinder, four-stroke, liquid-cooled, overhead valve, which was an upgraded version of the 998 cc (60.9 cu in) engine used in the Škoda 1000MB. This initially produced a rated motive power output of 46 kW (63 PS; 62 bhp) at 5,000 rpm. It originally used either a Pierburg 2E-E Ecotronic single-barrel carburettor, or a Pierburg Ecotronic dual-barrel carburettor. This engine had its combustion chambers redesigned by Ricardo Consulting Engineers in the UK, while German car maker Porsche helped engineer the engine mountings. Throughout its timescale in the Favorit, the engine was progressively upgraded with various iterations of emissions control systems, including two different types of catalytic converter, and also utilised improved fueling and engine control by way of Bosch Mono-Motronic single-point fuel injection. These changes had minor effects on the rated power (50kW) and torque outputs. The engine requires the cam chain changed every 60,000 km, but it can least over 200,000 km (cases of engines working 400,000 km without the change of cam chain are known, although with serious degradation of performance, respectively). The chain is relatively short, but has no tensioner. This engine was also used in Škoda Felicia with BMM and MPI injection, and until 2003 as a 1.4 MPI unit in the Škoda Fabia, and a 1.0 version in the Škoda Fabia, Seat Arosa and Volkswagen Lupo. The only transmission available was a five-speed manual gearbox, which was of a transaxle design, and contained the differential and final drive units. Drive was through the front wheels. The Škoda Motorsport-entered Favorit won outright in the 2-litre Manufacturers Championship category of the 1994 FIA World Rally Championship with a total of 43 points, despite having only a 1.3 litre engine. It defeated rival cars from manufacturers such as Ford, Citroën (AX Sport), Peugeot (205 Rallye and 205 GTI), Fiat (Cinquecento), Renault, Rover (Mini Cooper), Suzuki (Swift GTI), Daihatsu (Charade 1.3i), Lada (Riva), and even Trabant P 601. It also competed against cars from other marques from its future parent Volkswagen Group, namely Volkswagen and SEAT (Marbella GL). Works driver Pavel Sibera managed to pilot the Favorit into the overall top ten classification on two occasions, which included the main World Rally Championship category, and his team-mate Emil Triner achieved the same feat, with a highest placing of 9th overall in the Acropolis Rally, and 8th in the Rallye de España. There were also prototypes with Škoda's 1.6 OHC engine. A rally prepared Škoda Favorit. This is a non-official car used by a "privateer" to compete in the Czech Böttcher Rally. Škoda Favorit was a large luxury limosine produced in Mladá Boleslav from 1936 to 1941. Favorit Type 904 produced from 1936 had a 1.8L motor producing 28kW at 3800rpm, maximum speed of 95 km/h. By 1939 it was produced 169 units of this model. Škoda Favorit 2000 OHV (Type 923) produced in 1938-1941, had a more powerful engine with a capacity of 2091cm³ and 40,5 kW, which could reach 110 km/h. Last updated on 17 August 2013 at 09:10.